A caricature by James Gillray first by published by Hannah Humphrey on October 11th, 1791. This print is from the 1849 edition published by Henry G. Bohn with later hand colouring. The subject is Juliana Elizabeth Schwellenberg 'Down thither, prone in flight, Lo Schwelly speeds, & with her brings, the Gems, and Spoils of Heavn'. Lord Holland (1773-1840) suspected that the Queen transmitted to Germany through Mrs. Schwellenberg 'the money and presents which she obtained in England'. In her arms are two large money-bags, labelled 'Pr Ann.' and '£1000000'. Her bulging pocket hangs downwards, a rosary and cross hanging from it. Gillray - Patent Bolsters; Le moyen d'etre en-bon-point. A caricature by James Gillray first by published by Hannah Humphrey on October 13th, 1791. This print is from the 1849 edition published by Henry G. Bohn with later hand colouring. The subject is Maria Anne Fitzherbert (née Smythe) (1756-1837), Famous beauty; morganatic wife of George IV. She stands beside a dressing-table, her head turned looking at her reflection in the mirror. Above the dressing-table hangs an oval bust-portrait of the Prince of Wales surmounted by a crown and 'ich. dien'. Gillray - Count Roupee. Vide Hyde Park. More Info A caricature by James Gillray first by published by Hannah Humphrey on June 5th, 1797. This print is from the 1849 edition published by Henry G. Bohn with later hand colouring. The subject is Paul Benfield (1741-1810), who went out to India in 1764 as a military engineer in the service of the English East India Company. He resigned his commission to become a private contractor, and built a successful career as a banker and financier. He later was involved in a series of dubious loans. A caricature by James Gillray first by published by Hannah Humphrey on June 5th, 1797. This print is from the 1849 edition published by Henry G. Bohn with later hand colouring. The subject is Paul Benfield (1741-1810), who went out to India in 1764 as a military engineer in the service of the English East India Company. He resigned his commission to become a private contractor, and built a successful career as a banker and financier. He later was involved in a series of dubious loans. Gillray - Modern Elegance, A Portrait. A caricature by James Gillray first published by H. Humphrey on May 22nd, 1795 June 13th, 1782. This print is from the 1849 edition published by Henry G. Bohn with later hand colouring. Sitter is Lady Charlotte Susan Maria Bury (née Campbell) (1775-1861), a society beauty and poet and novelist, second daughter of John Duke of Argyll. A caricature by James Gillray, 'Pubd Octr 17th 1791. by H. Humphrey, No 18 Old Bond Street'. This print is from the 1849 edition published by Henry G. Bohn with later hand colouring. Lady Mount-Edgcumbe (Emma Edgcumbe (née Gilbert), Countess of Mount Edgcumbe) as a lean and ragged witch sits in profile to the right on a rocky mound overlooking the sea, her seat being a bundle of brooms. Gillray - Thirty years have I lived in the parish of Covent Garden, and nobody can say-Mistress Cole-Why did you so? A caricature by James Gillray 'Pubd. 16, Decr. 1797, by H. Humphrey, 27 St. James's Street, 1797'. This print is from the 1849 edition published by Henry G. Bohn with later hand colouring. It shows a face, wearing a plumed military hat, looking to the right out of a military boot. The back of the head is concealed by part of the boot. Gillray - Notorious Characters. No.1. A caricature by James Gillray first published by H. Humphreys on December 1st, 1797. This print is from the 1849 edition published by Henry G. Bohn with later hand colouring. Sitter is Samuel Ireland (1744-1800), Writer and engraver. 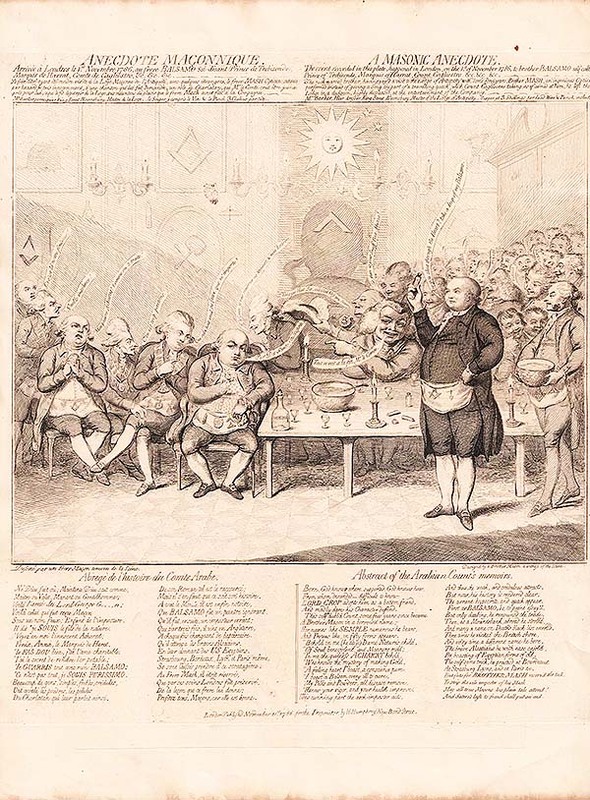 Gillray - A Masonic Anecdote . A caricature by James Gillray first by published by Hannah Humphrey on November 21st, 1786. A satire on Cagliostro's attempt to found an Egyptian Lodge in London in 1786. Shows a sitting of the Masonic lodge of Antiquity, at M. Barker, a wigmaker, King Street, Bloomsbury, master of the lodge, on November 1, 1786, at which the Earl of Cagliostro was invited; Where he was mocked, as the French and English explains, below the square line of the print, the "Abridged History of the Arab Count." This print is from the 1849 edition published by Henry G. Bohn. A caricature by James Gillray first by published by Hannah Humphrey on June 25th, 1791. Represents a map of England and Wales depicted as an old woman seated on a sea monster. The letters 'G.M.' in the bottom right is thought to refer to the well known painter George Morland. This print is from the 1849 edition published by Henry G. Bohn with later hand colouring. Gillray - The National Assembly Petrified / The National Assembly Revivified. More Info A caricature by James Gillray first published by S.W. Fores, No. 9, Piccadilly on June 28th 1791. This print is from the 1843 edition published by H. G. Bohn with later hand colouring. In the top engraving a French barber on the right, gesticulating says to six terror-stricken companions: "O sacre dieu! de King is escape! de King is escape". The foremost listener is a tailor, his shears stuck through the string of his apron, a measuring-tape round his shoulders, but wearing a cocked hat and sword. On the extreme left is a postboy. All have expressions denoting dismay. The barber has a comb stuck in his hair. The others wear tricolour cockades in their hats. In the lower engraving a group of ruffians listen with delight to a cook who says, taking a pinch of snuff "Aha! be gar, de King is retaken! Aha! Monsr Lewis is retaken! Aha!" In his cap is a tricolour cockade inscribed 'Liberty'; he wears over-sleeves, a spoon and fork are stuck through his apron-string, a string of frogs hangs from his belt. His most prominent listener is a shoe-black with a grotesquely wide grin, who stands, shoe in one hand, brush in the other. These much-caricatured ragamuffins are typical of the French republicans depicted by Gillray: at once ludicrous and horrible. A caricature by James Gillray first published by S.W. Fores, No. 9, Piccadilly on June 28th 1791. This print is from the 1843 edition published by H. G. Bohn with later hand colouring. In the top engraving a French barber on the right, gesticulating says to six terror-stricken companions: "O sacre dieu! de King is escape! de King is escape". The foremost listener is a tailor, his shears stuck through the string of his apron, a measuring-tape round his shoulders, but wearing a cocked hat and sword. On the extreme left is a postboy. All have expressions denoting dismay. The barber has a comb stuck in his hair. The others wear tricolour cockades in their hats. In the lower engraving a group of ruffians listen with delight to a cook who says, taking a pinch of snuff "Aha! be gar, de King is retaken! Aha! Monsr Lewis is retaken! Aha!" In his cap is a tricolour cockade inscribed 'Liberty'; he wears over-sleeves, a spoon and fork are stuck through his apron-string, a string of frogs hangs from his belt. His most prominent listener is a shoe-black with a grotesquely wide grin, who stands, shoe in one hand, brush in the other. These much-caricatured ragamuffins are typical of the French republicans depicted by Gillray: at once ludicrous and horrible. Gillray - Modern Hospitality, or A Friendly Party in High Life. A caricature by James Gillray first by published by Hannah Humphrey on 31 March 1792. This print is from the 1849 edition published by Henry G. Bohn with later hand colouring. More Info A caricature by James Gillray first published by H. Humphreys on June 13th, 1782. This print is from the 1849 edition published by Henry G. Bohn with later hand colouring. In 1782, on the 31st of May, the Irish Parliament voted the sum of £50,000 for purchasing an estate, and erecting a mansion thereon, to be settled on Henry Grattan, as a reward for his work in the cause of Irish independence. A caricature by James Gillray first published by H. Humphreys on June 13th, 1782. This print is from the 1849 edition published by Henry G. Bohn with later hand colouring. In 1782, on the 31st of May, the Irish Parliament voted the sum of £50,000 for purchasing an estate, and erecting a mansion thereon, to be settled on Henry Grattan, as a reward for his work in the cause of Irish independence. Gillray - Democratic Glory (and) Democratic Consolations. More Info Two caricatures from a series of eight arranged in rows depicting ther 'The Life of Buonaparte' A caricature by James GILLRAY, London published by John Miller, Bridge Street and W.Blackwood, Edinburgh. Circa 1820. Early Colouring. Two caricatures from a series of eight arranged in rows depicting ther 'The Life of Buonaparte' A caricature by James GILLRAY, London published by John Miller, Bridge Street and W.Blackwood, Edinburgh. Circa 1820. Early Colouring. 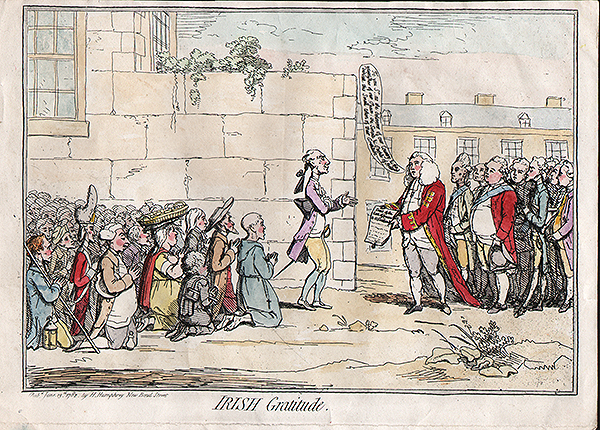 Gillray - Democratic Gratitude (and) Democratic Religion. Gillray - Democratic Courage (and) Democratic Honor. More Info Two caricatures from a series of eight arranged in rows depicting ther 'The Life of Buonaparte' A caricature by James GILLRAY, London published by John Miller, Bridge Street and W.Blackwood, Edinburgh. Circa 1820. Early Colouring. Repaired tear to the bottom of the image on the left. Two caricatures from a series of eight arranged in rows depicting ther 'The Life of Buonaparte' A caricature by James GILLRAY, London published by John Miller, Bridge Street and W.Blackwood, Edinburgh. Circa 1820. Early Colouring. Repaired tear to the bottom of the image on the left. Gillray - Life of Bonaparte: Democratic Innocence (and] Democratic Humility. Gillray - Two Penny Whist. A caricature by James GILLRAY, London published by John Miller, Bridge Street and W.Blackwood, Edinburgh. Circa 1820. Early Colouring. Gillray - HEROES Recruiting at KELSY'S - vide St. James's St. on the 4th June. Gillray - "Oh! that this too too solid flesh would melt. A caricature by James GILLRAY, London published by John Miller, Bridge Street and W.Blackwood, Edinburgh. Circa 1820. Early Colouring. Some marginal soiling. Gillray - Dumourier dining in State at St. James's on the 15th May, 1793. A caricature by James GILLRAY, London published by John Miller, Bridge Street and W.Blackwood, Edinburgh. Circa 1820 with later hand colouring. Gillray - "Oh! Listen to the voice of love". Gillray - More Pigs than Teats. Gillray - The Genius of France nursing her darling. A caricature by James Gillray first published by H. Humphreys on November 26th, 1804 with later hand colouring. This print is from the 1849 edition published by Henry G. Bohn. Gillray - The York Minuet. Gillray - The Jersey Smuggler detected; or Good Cause for Discintent - Marriage vows are false as Dicers oaths. Gillray - "and would'st thou turn the vile Reproach on me?" Gillray - Swearing to the Cutting Monster. Gillray - Palemon and Lavinia. "He saw her charming; but he saw not half, The Charms her downcast Modesty conceal'd"
Gillray - A Decent Story. A caricature by James GILLRAY, London published by John Miller, Bridge Street and W.Blackwood, Edinburgh. Circa 1820 with early hand colouring. Gillray - Advantages of wearing a Mulsin Dress! - dedicated to the serious attention of the Fashionable Ladies of Great Britain. Gillray - Lubber's Hole, alias The Cracked Jordan. A caricature by James Gillray first published by H. Humphreys on November 1st, 1791. This print is from the 1849 edition published by Henry G. Bohn with later hand colouring. Repaired tear in top left corner. Gillray - The Arch Duke. Gillray - Wha Wants Me? Gillray - The coming of the Monsoons; - or The Retreat from Seringapatam. Gillray - Miss, I have a Monstrous Crow to pluck with you!! Gillray - Ladies Dress as it soon will be. Gillray - The Grand Signior retiring. Gillray - Pylades & Orestes. Gillray - The Fall of Phaeton. "Th' imaginary Bride with Beauty glows, For Envy magnifies whateer She shows"
Gillray - Evacuation before Resignation. Gillray - Bank Notes - Paper Money; French Alarmists - o the Devil the Devil! ah! poor John Bull!!! Gillray - Elements of Skateing - The Consequences of going before the wind. Gillray - Elements of Skateing - Making the most of a passing friend in a case of Emergency. Gillray - Elements of Skating - Attitude ! Attitude is everything ! A caricature by James GILLRAY, London published by John Miller, Bridge Street and W.Blackwood, Edinburgh. Circa 1820. Later coloured by hand. A caricature by James GILLRAY, London published by John Miller, Bridge Street and W.Blackwood, Edinburgh. Circa 1820. Later Colouring. Gillray - Breathing a vein. A caricature of Polly Lyon de Symons (née Goldsmid) (1753-1841), Wife of 'Baron' Lyon de Symons. by James Gillray first published by H. Humphreys on July 13th 1801. This print is from the 1849 edition published by Henry G. Bohn. Later hand colouring. Gillray - Punch cure the Gout the Colic, - and the Tisick. A caricature by James Gillray first published by H. Humphreys on July 13th, 1799. This print is from the 1843 edition published by H. G. Bohn. Later hand colouring. Gillray - An Old Maid on a journey. Gillray - Theatrical Mendicants relieved - "Have pity upon all our Aches and wants." Gillray - Venus Attired by the Graces. Gillray - The National Assembly Petrified. Gillray - The National Assembly Revived. Gillray - The Friend of the People; and his Petty New Tax Gatherer paying John Bull a visit. Gillray - Progress of the Toilet - The Wig. Gillray - Progress of the Toilet - The Stays. Gillray - Waltzer au Mouchoir. Gillray - Playing in Parts. Gillray - The Bear and his Leader. Gillray - Making Decent - ie - Broad Bottoms getting into the Grand Costume. Gillray - The Rake's Progress at the University. No1.